Fur Chewing, Fur Slip, Knots, Priming and Wet Fur. Photo Credit, Tabatha V. . Chaos was surrendered to LLC & Tabatha v. on Dec 23 2016. He was a sad case of neglect. Fur Chewing, also known as Fur Barbing, is when a Chinchilla chews their own fur. Some chinchillas chew fur more than others, or only chew other chinchillas. 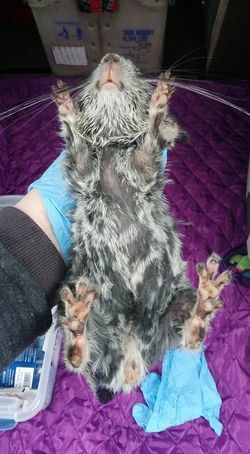 A fur barber could have just a few patchy spots, or be chewed so badly that they only have a strip of fur extending down their back were they can not reach. It is commonly thought that barbing is a hereditary trait, which is true, but It's also said to be influenced by a chinchilla's home environment as well. As said above, It's believed that fur chewing can be passed down from parents to offspring. Talking to breeders, some believe it's a chemical imbalance in the brain. Of course, I personally have no research to confirm it is genetic, but large ranchers are a reputable source of information. Nurture : Some kits are taught to chew fur by their mother. Stress: A stressful home will result in a stressed pet. It could be the location of the cage is not ideal, another family pet harasses your chinchilla, you may have loud children who make your chinchilla uneasy, the cage may not be ideal for your pet, etc. Boredom: A Chinchilla who lacks stimulation may begin to chew their fur because they're bored. Medical : A chinchilla who has dental issues my chew at their chest, or pull at their fur on their face to try to find and stop the pain. A skin issue could prompt a chinchilla to chew at their fur. An amputation may result in phantom-limb syndrome, and the pain from that may prompt your Chinchilla to chew at the area. Can you stop a Chinchilla from Fur Chewing? Generally, no. You "cure" a Chinchilla who chews their fur if it's from genetic causes. Once they start, they almost always continue. It wouldn't hurt to try though, because it may just be environmental. In some cases, like Chinchillas who chew because they're bored, can be improved or stopped once they turn their attention onto chew toys. Same goes for chinchillas who chew because they're sensitive and stressed out over something simple. If you can find the root of the stress, and fix it you may see some improvement. If they're chewing because some medical cause, it's best to focus on the issue and worry about the chewing later. A healthy chinchilla is a happy chinchilla. Will Fur Chewing hurt my pet? It's only a superficial flaw. A fur chewed chinchilla can still be a happy, loving pet who lives a long life if given the proper care. 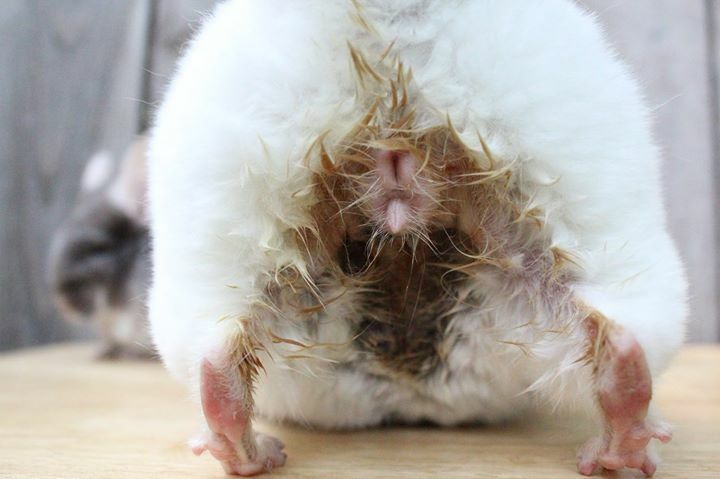 Be sure to talk to your vet about preventative measures for hairballs, because it's not something a chinchilla is normally suspected to have or able to pass on their own. I do encourage trying your best to eliminate all stress from your pet's life, because a very high-strung chinchilla who is continuously stressed may begin to self mutilate rather than only chew fur. If your pet does this please seek medical attention right away! This bald patch shows where a large amount of fur was slipped. Fur slip is when a chinchilla releases a patch of fur. This can happen for a variety of reasons. Chinchillas are prey animals, and in the wild they would use this fur slipping technique to escape from predators. In captivity chinchillas use this tequnique to avoid being caught by their owners. If caught a Chinchilla would release their fur and have a chance to flee while their predator or owner is left with a clump of fur. Improper handling, or rough handling can cause your pet to slip his or her fur. A scared chinchilla is 2x more likely to slip their fur. Other causes are having accessories in the cage that catch the fur, or cage mates squabbling. If you suspect squabbling cage mates, separate them at once to avoid further more serious injury. The best way to avoid causing your Chinchilla's fur to slip is to handle him/ her correctly and gently. Never just grab your chinchilla abruptly. Be sure to alert your pet that you're approaching them. You can scoop up your Chinchilla with your hands, or firmly grasp the base of the tail and support their weight with your free hand under their belly. From here you can bring them to your chest and hold them close, loosely. Always be gentle with your pet. Proper handling, held from the base of the tail and supported under the belly. You can handle from just the base of the tail if your pet is calm. Never jerk your pet around from the tail. 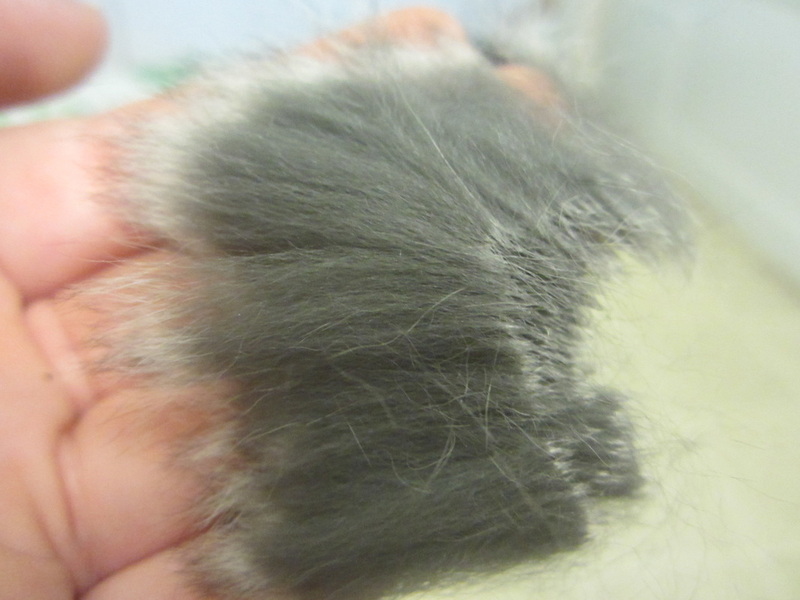 Here is live fur slip from a standard chinchilla. There's no special after care for fur slip. The hair will begin to re-grow and should be back within 6 months. All that there is to do is to improve on handling. A larger patch may have some sensitivity to it, but generally no. Fur slipping does not hurt your pet. The damage comes from being fearful, and stressed. That is detrimental to your pet's mental health. You should continue to work on your bond to ease the stress and fear of being handled. Photo by Chinchilla Chateau Top left photo - Chinchilla in prime Middle right photo - Dead fur Bottom left photo - Groomed chinchilla. Fur priming is when a chinchilla sheds it's old fur and replaces it with a new coat. In perfect conditions chinchillas prime 1/3 of their fur every 90 days. Season, temperature or humidity change will cause a chin to prime earlier or later than normal. The new strands push the old out of the way. The old fur will appear longer and make the coat look rough. This is only temporary though. 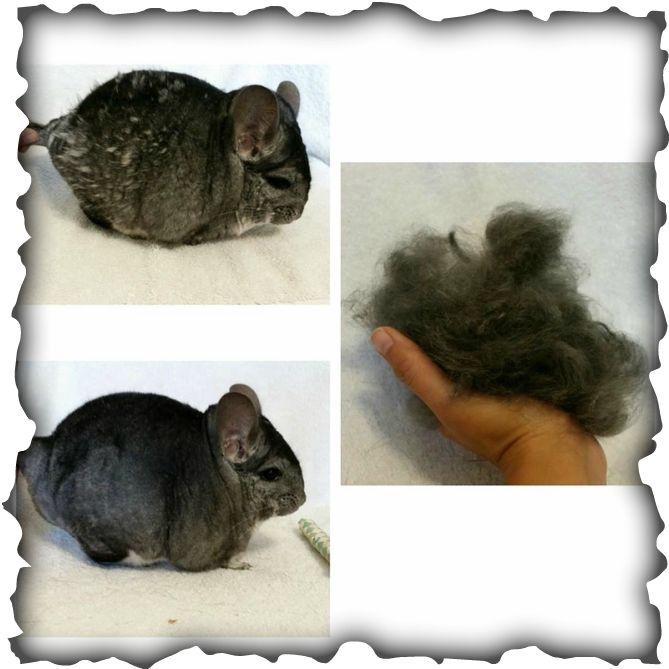 As your chinchilla blows their fur the dead fur will fall out, it may take longer for chins with very dense fur. Priming starts at the head, works it's way down the back and over the shoulders. Eventually it ends at the rump and tail. Once the prime line reaches the tail time your pet's coat is in it's best condition, and will stay at that state for a couple weeks. During priming your pet's coat will look rough or patchy. This is temporary. Dense chins will take slightly longer to shed their fur. You can help remove dead fur by grooming your chinchilla ( see chinchilla grooming section ) or you can gently roll a sticky lint roller to lift the loose fur off your chin. Knots in the fur visibly look similar to priming, or feel like hard small peas in the fur. To remove knots you can groom your pet gently ( see chinchilla grooming section ) or you can gently grip the knot and give a swift tug. Your pet should fur slip and the knot will be released. If you pet makes a kacking /bark noise it is because he/she is annoyed. Fur slip is not painful. It's very important not to get your pet Chinchilla wet unless directed by a medical professional or in an emergency. A chinchilla's dense fur coat will absorb and hold onto moisture. The moisture trapped in the undercoat will produce a moist and warm environment, perfect for ring worm. This can be a very difficult fungus to treat, so it's best to avoid it. If your pet becomes wet ( a few drops isn't a reason to panic ) you should : Towel dry your pet as much as possible paying close attention to the undercoat. Then use a blowdryer on the lowest setting to finish drying the fur. 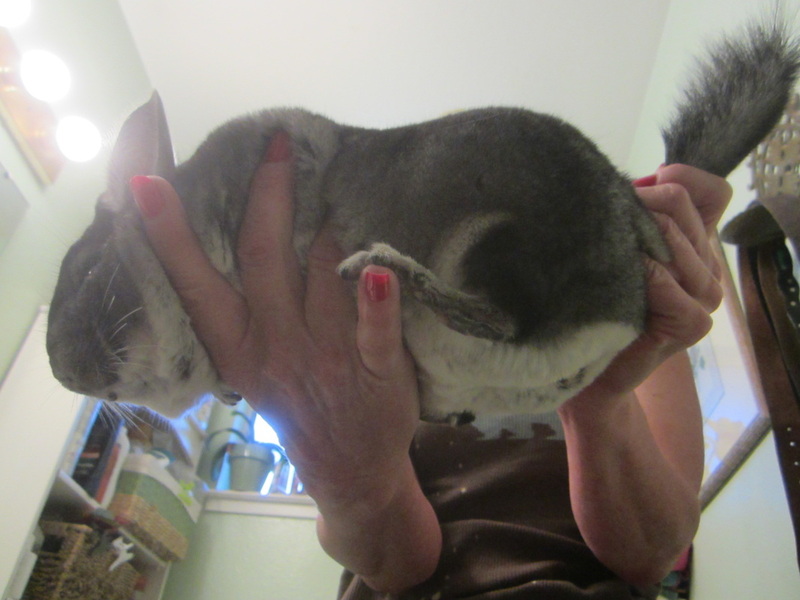 Once dry to the touch your chinchilla should be placed in a draft free area. ​" People freak out when they talk about a chin getting wet... but, when a female delivers they get pretty wet. For the most part the fur dries just fine. Although belly fur does tend to thinner and dry faster. " - Narcissus Kimball of Aces Up Chinchillas. And she's right, Unless your pet is drenched it's not the end of the world. If you are concerned about getting your pet wet with water, you can always add Tinactin Foot Power to their dust as well. The active ingredient Tolnaftate is used to combat ringworm ( fur fungus as it's commonly called ) . It's wise to use it if you live in a humid area as well due to the high levels moisture in the air. Add corn starch to the dust bath ( about a tablespoon ) which will help whiten the fur. And, if you are concerned about getting your pet wet with water, you can always add Tinactin Foot Power to their dust as well. The active ingredient Tolnaftate is used to combat ringworm ( fur fungus as it's commonly called ) . Urine staining is a common issue with chinchillas. It can happen due to medical issues or be the result of lazy husbandry. Luckily, it's easy to get rid of. If your pet is sick, they should see a vet. Simple common Urinary Track Infections ( UTI's ) often result in a small discomfort to urinate and staining around the gentiles. Visit your vet for a diagnosis and treatment. Once you start or finish treatment you may tend to the stain caused by the urine. Sometimes Chinchillas are lazy and sit in their urine. If you are using solid floors ( plastic, wood, metal, tile, linoleum, etc ) there is nowhere for the urine to go aside from setting on the surface. As your pet sits in it, or hops through it, the urine is absorbed by the fur. Some pet owners use fleece liners. If your fleece liners are your only source of bedding, more often than not the urine fails to wicker through the fleece. Causing the same situation as solid floors, resting and being absorbed by your pet's fur. The best way to prevent urine staining is by providing a safe absorbent bedding, like KD Pine shavings or Aspen Shavings. These wood shavings will absorb the urine and leave nothing for your pet's fur to soak up. As long as you clean weekly, you should not have this issue.